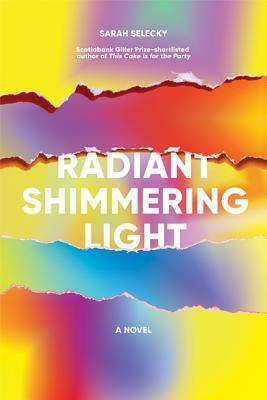 I am writing to you today about an exciting life-changing opportunity – Sarah Selecky’s new novel Radiant Shimmering Light. This brilliant book has enhanced the way I see the world. It has inspired me to be my natural self every day, and I strongly believe it will do the same for you. The characters in Radiant Shimmering Light are obsessed with posting Instagrams and Tweets and Newsletters, and with checking their Likes and comments. They feel compelled to snap pictures of everything and post it instantly, tagging people and sending them all the hearts. When 40 year-old Lilian (Hooray for characters in their 40s!) goes to work for her internet-famous cousin in New York City, her dreams start coming true; she connects quickly with the other female employees, she becomes more in tune with her spiritual self, she feels valued, and she starts making enough money to pay off her debts and then some. Lilian becomes part of something that is bigger than herself – something that every woman wants – to be empowered and live your life to the fullest. To be spiritually connected to everyone else on earth and psychically send them positive vibes and lots of love (’cause that’s totally possible). But you and I both know that the only way to reach true enlightenment is to read books. Right? I mean, books are the only thing that matter in this world, and for those of you who haven’t figured that out yet now is your chance to see the light. I’ve included this tutorial (for free!) for any of you who are interested in learning how to empower yourself through reading and change your life. I can only hope that you continue to share your knowledge and experience with other readers and non-readers. Spread the book love and literary connections! And please, Dear Readers, take the opportunity to find out more about Consumed by Ink and what we’re all about here. And, oh yeah, don’t forget to read Radiant Shimmering Light. Make sure you leave some quiet time to reflect on it, as you read, to get the most out of it. You won’t regret it! Until next time, may you feel whole and alive through literature and your fellow readers. Click here to to fill out a survey and let me know what you think of my new format. While you’re at it, click here to show your love and donate some money to a good cause! And don’t forget to click here to vote on what you’d like to see me read next. Thank you for all your support today and in the past. Let’s journey ahead together. I really do think her depiction of our on-line world is brilliant. I found Lilian’s character endearing. Even though her addiction to social media is irritating (I think it was supposed to be, and is it really that much worse than the rest of us? ), it’s obvious that she cares about the people she connects with. I couldn’t help but smile at her attempts to correct her “negative self-talk”, and her pleasure at being of value to others. The story was unpredictable. I thought I knew where it was going to go. But I was wrong. Which made me think about it more. Which led to my realization that the book is more brilliant than I first thought. Somehow she pokes fun at the same time as being serious about it. How does she do that? Near the end of the book, there are a few too many descriptions of auras and their wide variety of colours. It made the last quarter of the book feel longer than the first three quarters. I power my phone down and slip it in my purse’s phone pocket. There’s a floating moment, not unpleasant, where I feel the freedom of not having it in my hand, but this quickly turns into blankness that I fill with thoughts. What am I missing? Should I have deposited the money right away? What if people are commenting on my feed? I won’t get my texts, but anyone who sends me a text won’t know where I am, or why I can’t answer. Unless they see my feed, because I just posted a pic of where I am right now, so they can see that. Oh, my active mind! I get a pretzel from a street vendor I pass on my way to the subway. I cover each bite with a squirt of yellow mustard. The dough is soft and warm and steamy in the chilled air. I lose myself in it: the crunch of the salt and the tang of the mustard. I know the gluten is inflammatory, and the white flour will make my blood sugar spike. All this salt will make me bloated. I know it, but I eat it anyway. Get to know a little bit about Sarah Selecky. Love it! I still think about this book and still feel a very strong need to step away from heavy social media usage! The strongly satirical look at how ridiculous our online world has made us, through Sarah’s eyes, was fantastic reading. I loved how you formatted your review Naomi!! Brilliant. The scary thing is I see the tendencies in my kids to always “need” to have their ipods/phones near them in case they get a notification. Or in case they’re “bored” for a minute (or a second). Taking breaks from the internet is one of the reasons I value our camping trips so much! This post confused me at first, but I think I get it. I really like Selecky, even took one of her classes online, but finally unsubscribed from her because I felt I was getting too many marketing emails, some of which I did not care for. So, I suppose we are all struggling with this, especially writers or those with online businesses….and good that she was able to write so well about it. That doesn’t really surprise me – she’s really good at writing about internet marketing in her book! I’ve also read her short story collection, which I think I liked even more! Naomi, you did a great job writing this post. Loved your post. It is rare that I laugh out loud at a book review! Well done. I can hardly wait to read the book. Thank you for saying so, Brian – I was a little nervous to press the publish button for this one! I love it. Excellent review, Naomi. I’ve been wanting to read this and now I really want to read it soon. I wanted to go to hear Sarah Selecky read from her last book when she was in Halifax, but on that day it happened that I needed to make a cake to take to my brother’s engagement party. I wonder if she’ll be back to read from this novel. I hope so! I would also be keen to go! I use Twitter to tell people about my book reviews but I was never very active on Facebook, using it mainly to keep in touch with overseas relatives… but I posted pictures of my triumphs in the kitchen and shared my recipes with friends and occasionally bragged about where I was (if it was an interesting place or a good restaurant!). I liked their posts, of course, but I never got into arguments and stopped following anyone who was unpleasant about anything in the way that I would avoid people like that in my real life. (I was surprised to find out some of the attitudes of people I’d worked with, via Facebook. That was useful, in a sad way). But with all the stuff about fake news and endless hassles with friends’ accounts being hacked, I took a step away from it. I haven’t deleted the account, but I look at it once a week if that (which is really just in case a friend with a mental illness has used it to contact me). I don’t respond to any notifications, I contact the person personally, if it’s warranted i.e. not just mindless tagging, which it mostly is. It’s been interesting. I’ve gone back to sending get well and sympathy cards, I’ve visited friends and phoned more often because I want to keep in touch with them, and (this is the weird part) I’ve felt a mild sense of loss about not being able to brag. And I wondered why this was. It made me realise that I had developed a mild case of showing off and bragging. Apart from feeling happier and more connected with the real people I like, I also have more time each day. I had not realised how much time I was wasting until I wasn’t doing it any more! Yes! It’s so true… you don’t realize the time it’s taking out of your day until you take a break from it. And I find with the kids, when they are on internet breaks, they go back to being able to think up creative things to do, like they did when they were younger and didn’t know about ipods and tablets and computers. Sigh. Thanks for your thoughtful comment, Lisa! This sounds a little too inspiring for me. Just kidding! Great cover! Haha! If my newsletter was “too much” for you, you mind find the book way too much! Or you might feel awe-struck by the author’s ability to write all those inspiring messages over and over. I can tell you had fun writing this 😉 I sure had fun reading it! Good lord, she’s food obsessed in that pretzel quote. Is she like that the whole book? I hope not. If she added in some caloric info, she’d be Bridget Jones. No calorie counting… just the new trendy stuff like gluten and carbs, and a lot of vegan food. I wouldn’t say there’s too much of it – just enough to give a sense of what they think about in connection with food. Food trends are definitely a thing. Very creative-love this post! There are two main reasons I really want to read this book: 1) I love the cover 2) I loved her short story collection, and based on your review, no doubt I’d love this too! Yes, I think you’ll like it! Isn’t the cover pretty?! gorgeous! I just ordered The Italian Teacher by Tom Rachman and I also love that cover-very colourful and fun. We’re all just a bunch of guinea pigs! Sounds like a unique read!! i too have children that are far too connected and “need” to be connected” and might just admit that I have these tendencies as well. i enjoyed your unique review style! Haha, I loved this review and it does make me want to pick this up. I really like books that manage to do a good job incorporating social media, while I hate those that rely on pretending it doesn’t exist to make the plot work. Exactly. I really have never read a book quite like this one. It’s so well done! Now I want a soft pretzel! I’m adding this author to my TBR list. We have an earlier book of hers, The Cake if for the Party, in my library system. What a great response to and review of the book: nicely done! This is one that I plucked off the “new” shelf at the library with great excitement (I really enjoyed the stories) and then, a couple of days later, realized that there was no way I was going to get to it anytime soon, so I took it back (and someone else snapped it up, which is as it should be), which now makes me very sad. I should tweet about how sad i am. It *is* a long 350 pages, if that makes you feel any better. Next time you’ll be ready!